with it's 2 inch wide clear acrylic base and black markings every 1/8 inch. This Scrapbook Ruler is great for placing photos, photo mattes or borders on the scrapbook layout even with the edge of the paper, or aligned with any straight line. Placing the ruler on the layout and aligning the grid markings, on the short end of the ruler, keeps the ruler at a horizontal level. Further aligning the ruler using the longer grid markings along the edge of paper makes it easy to place objects at a consistent distance from the edge. These rulers are also known as Quilting Rulers and cam be found in many shapes and sizes, but their key is the clear acrylic with visible grid lines. Another Convenient Scrapbook Ruler is the zero-centering ruler. These rulers with a Zero mark in the Center of the ruler, are used for centering any type of object in the middle of the page. Say, for instance, you want to put a title or text on a title block that is 10 inches wide. 1. Position the Zero-Centering ruler on the title block with the edges of the title block at the 5 inch mark on each side of the ruler. 2. The Zero mark will now be at the center of your text. 3. Measure your text, let's say it is 7 inches long. 4. To find the center of the text, your edges would be 3 & 1/2 inches from the zero mark on each side of the ruler. 5. Align the 2 Zero Marks, placing the text over the title block and you have centered the text on the block. Tearing Rulers come in handy for tearing paper and cardstock. I know, you don't really need a ruler to tear paper, but it does get hard sometimes to tear heavy cardstock. These particular rulers can assist you in tearing paper in certain designs, like a wave, scallop, or deckle edge. The Metal Cork-backed Ruler like we often see in offices, is great to use when you can to cut with a craft knife. The cork on the bottom helps to grip the ruler and hold it against the paper without slipping. The metal edge will not be cut with the craft knife. 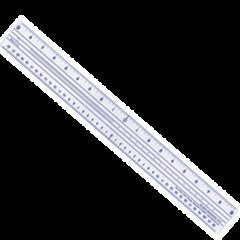 These rulers normally come in 6 inch, 12 inch and 18 inch lengths. The Craft Knife is often easier to use on come cuts than a pair of scissors. Say you want to cut a slit into a piece of paper or cardstock, maybe to slide a photo into or a piece of ribbon through. A pair of scissors, no matter how small they are, may bend the cut edge of the paper. 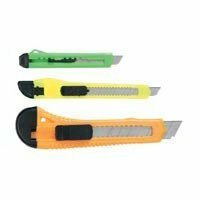 Using a metal edged ruler, a Craft Knife, and a self hearing cutting mat will make the cut much easier, much quicker and more accurate. These Self Healing Mats are wonderful for protecting your work surface when using a Craft Knife and Scrapbook Ruler or when you want to use as a backing with an eyelet punch to cut a hole for an eyelet or brad. They come in various sizes like 4 inches square to use for small projects, hole punching, and eyelet setting. 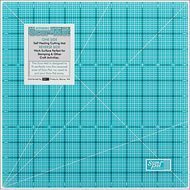 The larger mats, up to 12 & 1/2 or 13 inches square, are great for larger items such as cutting 12 x 12 inch paper in half or on the diagonal, or cutting boards and title blocks. Below is our Ruler, Craft Knife and Cutting Mat store by Amazon. Hopefully, you will be able to find what you are looking for to fit your needs. When you purchase from this page, you are actually purchasing from Amazon.com. All orders go through Amazon's secure order server.If you have questions, please Contact Us. I hope you have found some useful information concerning Scrapbook Rulers and how to use them. Please let us know if you would like any more information on them.